The new, factory sealed NBC 'Quick Doff ' butyl rubber hood was designed for U.S. Military issue M40/42 Series Protective Gas Masks, but will also work with many other US and foreign-made gasmasks (C3, C4, S-6, S-10, M95, FM12, MCU2P, M-15 etc.). An essential accessory for your gas mask! 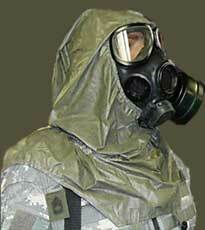 The quick doff chemical hood features an elastic face opening and adjustable underarm straps with plastic snap buckles. The quick doff Butyl rubber hood is designed to protect wearer's head, neck and shoulders from NBC (nuclear, biological, chemical) contamination. *GasMasksAndFilters.com acts as a third-party distributor and cannot be held responsible for the level of protection the products available for purchase on this web site provide. The products are sold as is, and items are not returnable once shipped. *WARNING: These items cannot be shipped to Canada. Please check your State, County and City laws for restrictions before ordering this product. We only ship to the U.S. – no international orders accepted.